Three top five finishes for Team JCT600 with GardX driver Sam Tordoff was enough for him to extend his advantage at the top of the standings. Pole-sitter Plato celebrated his 500th BTCC race in style by taking a commanding lights-to-flag success in the opener, becoming the 11th different winner in this incredible season so far. The Silverline Subaru BMR Racing driver built a strong gap over the first half of the race, before Team IHG Rewards Club’s Jack Goff began reeling him in. Plato’s advantage was then completely eradicated by a safety car period, but he managed the remaining racing laps with consummate ease to claim a staggering 95th career victory. Goff and Colin Turkington completed the podium positions. Triple champion Neal then clinched a Knockhill classic as the Halfords Yuasa Racing driver stormed through from eighth on the grid to win race two at the Fife track. Neal gradually made his way up the order while Subaru battled BMW for supremacy at the head of the pack. Long-time leader Plato began to struggle late on as he backed up the chasing pack behind him. 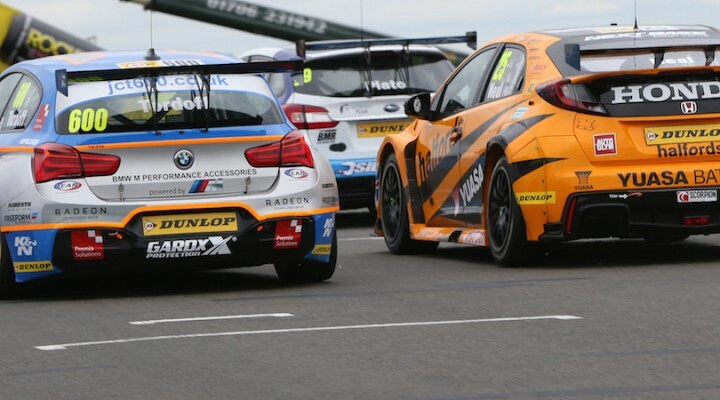 Tordoff and Turkington traded second position on several occasions, but neither could make a move by the defending Plato. Honda man Neal nipped past both Turkington and fourth placed Goff after the pair made contact on the exit of the final hairpin, and when Plato strategically held up Tordoff again on the penultimate lap Neal eyed his opportunity to blast into the lead. You could have thrown a blanket over all three cars as they shot across the line to start the final lap, and when the dust settled it was Neal from Tordoff and Plato taking the podium positions. Jackson produced his own memorable defensive drive in the final encounter, as the Motorbase Performance driver fended off a gaggle of cars to claim his fourth win of the season. It was status quo in the opening laps as initially, Jackson led the squabbling duo of Rob Collard and Turkington. That scrap spilled over on lap eight as Turkington’s Subaru tapped Collard’s BMW into a lurid slide. Further contact ensued as the damaged Team JCT600 with GardX car straightened out, and both cars were fired onto the grass and out of contention. This brought Tordoff, Plato and home hero Gordon Shedden into play as Ford battled BMW, Subaru and Honda. The quartet remained inseparable throughout the remainder of the race, but any attempts to make a pass were always quickly rebuffed. The leaders were covered by just 1.2 seconds as the chequered flag fell, with Jackson celebrating the win ahead of Tordoff and Plato. In a day that was largely dominated by the aforementioned marques there was still a top six finish for the Toyotas of Tom Ingram and Rob Austin, whilst the other Motorbase Ford of Andrew Jordan took a best of sixth in race one. The fallout from a frenetic day of action sees Tordoff now leading Neal by nine points in the race for the championship. Collard, Shedden, Jackson and Plato also remain in close contention. WSR/Team JCT600 with GardX top both the Manufacturers’ and Teams’ standings, whilst Jordan/Motorbase head the respective Independent Drivers’ and Teams’ tables. MG Racing RCIB Insurance driver Ashley Sutton leads the Jack Sears Trophy, although honours in that class went to Mark Howard at Knockhill. The entire BTCC community, including all 31 drivers, paid their respects to inaugural champion Jack Sears with a minutes silence prior to today’s action. Rounds 22, 23 and 24 of the 2016 Dunlop MSA British Touring Car Championship take place at Rockingham on 27/28 August.